If you have a business near Brookvale or in New South Wales we are the business brokers that can make selling your business easy. Being part of a group of business brokers that help each other sell business. Puts us miles ahead of our competition, why not contact us today and see what we can do to help you. Contact us today. 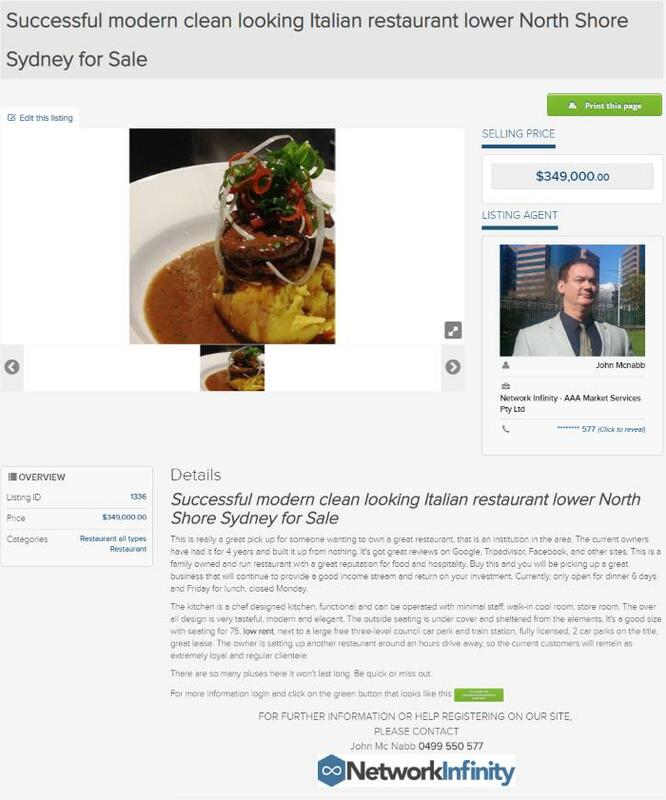 This is really a great pick up for someone wanting to own a great restaurant, that is an institution in the area. The current owners have had it for 4 years and built it up from nothing. It's got great reviews on Google, Tripadvisor, Facebook, and other sites. This is a family owned and run restaurant with a great reputation for food and hospitality. Buy this and you will be picking up a great business that will continue to provide a good income stream and return on your investment. Currently, only open for dinner 6 days and Friday for lunch, closed Monday. The kitchen is a chef designed kitchen, functional and can be operated with minimal staff, walk-in cool room, store room. The overall design is very tasteful, modern and elegant. The outside seating is under cover and sheltered from the elements. It's a good size with seating for 75, low rent, next to a large free three-level council car park and train station, fully licensed, 2 car parks on the title, great lease. The owner is setting up another restaurant around an hours drive away, so the current customers will remain as extremely loyal and regular clientele. There are so many pluses here it won't last long. Be quick or miss out.